a spider web. 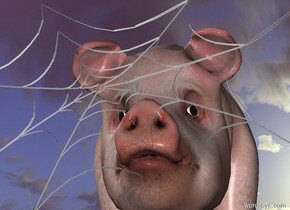 a small pig is behind the web. 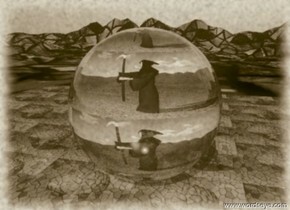 A sword is in the stone. 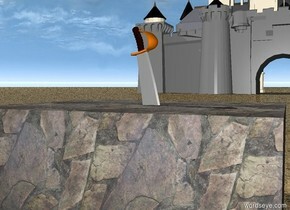 a castle is 100 feet behind the stone. the ground is dirt. 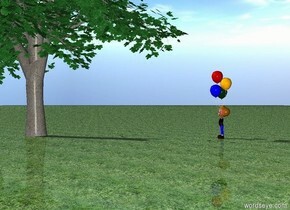 A boy is facing a green tree. ground is grass. a few big shiny things are in the small shiny cave. the big man is facing the cave. the big woman is 8 feet in front of the man. the big dull grey child is 16 feet in front of the woman. 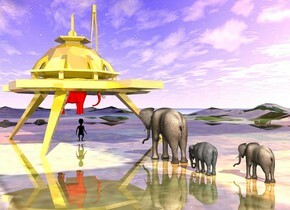 the small coat rack is 6 feet to the left of the elephant. the ground is dirt. the small peacock is -6 inches above the coat rack. the hot dog is on the grill. a small upside down cow is 6 inches above the hot dog. A small upside down sheep is next to the cow. it is leaning left. the ground is grass. it is cloudy. 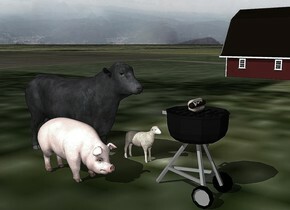 the small barn is 20 feet to the right of the grill. the small pig is above the sheep. it is leaning right. the huge trout is 2 feet to the right of the pig. it is leaning left. it is face down. 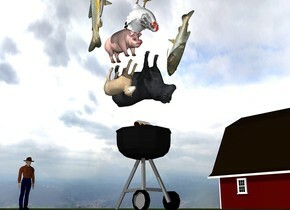 the large upside down chicken is above the pig. it is to the right of the pig. the second huge fish is 6 inches to the left of the pig. it is face up. the small man is 8 feet behind the grill. The very tiny white chicken is on the white shiny mountain range. it is facing right. It is cloudy. The first very tiny house is 20 feet behind and 6 feet to the left of the chicken. The second very tiny house is 8 feet behind the first house. The third small house is 20 feet behind the second house. the small church is 140 feet behind the third house. the very small pole is 5 feet to the left of the first house. it is facing right. 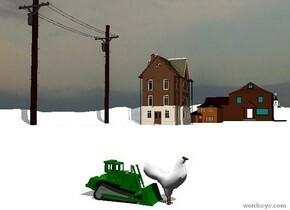 the green bulldozer is -1 inches to the left of the chicken. 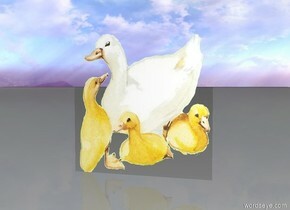 it is facing the chicken. it is 2 inches wide. 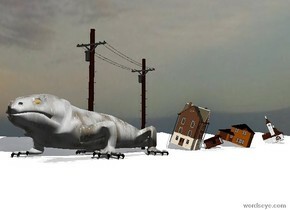 The very huge white foam lizard is on the white shiny mountain range. It is cloudy. The first very tiny house is 10 feet behind the lizard. It is leaning left. The second very tiny house is 8 feet behind the first house. It is leaning right. The third tiny house is 20 feet behind the second house. It is leaning left. the small church is 120 feet behind the third house. it is leaning right. the small pole is 5 feet to the left of the first house. it is facing right. the white foam whale. the tiny white dinghy is 5 feet in the whale. the white light is 1 foot above the boat. 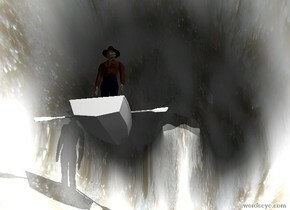 the tiny man is in the boat. the white whale is on the white foam mountain range. it is facing east. it is face down. it is cloudy. 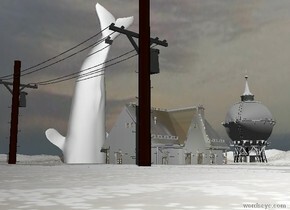 the small white foam house is 7 feet to the right of the whale. 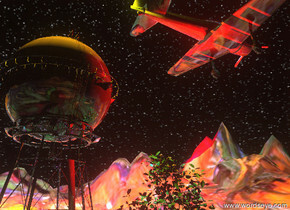 the silver water tower is 40 feet behind the whale. it is 40 feet tall. the ground is water. the pole is 6 feet in front of the house. 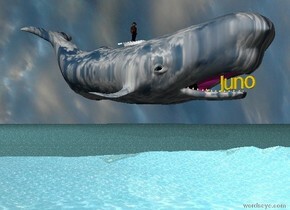 the small whale is 8 feet above the shiny water mountain range. the whale has a [cloud] texture. it is facing right. the water ground. the sky is cloudy. the tiny white dinghy is on the whale. it is facing left. the tiny man is in the dinghy. he is facing right. the small gold "Juno" is -1.3 feet to the right of the mouth of the whale. the road is on the grass mountain range. the tiny red hippo is on the road. 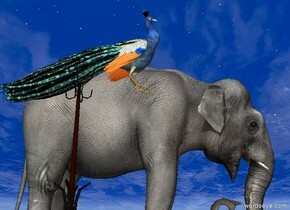 the small bird is on the hippo. the road is 80 feet long. the hippo is facing left. it is cloudy. 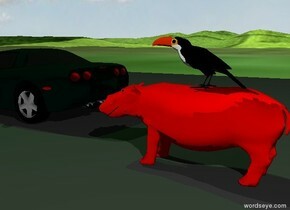 the tiny sports car is 1 foot to the left and behind the hippo. it is facing left. the green light is 2 feet above the car. 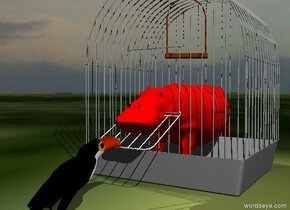 the tiny red hippo is in the birdcage. it is cloudy. the ground is grass. the small bird is in front of the birdcage. it is facing the birdcage. The paint of the giant pencil is purple. the child is to the right of the pencil. the pencil is facing up. The small bed-vp11698 is behind the child. the bed is facing right. 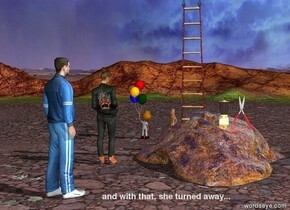 the child is facing southeast. the rat is on the bed. the rat is facing the child. the ground is shiny. the green wall is behind the bed. the blue wall is to the left of the bed. the blue wall is facing right. 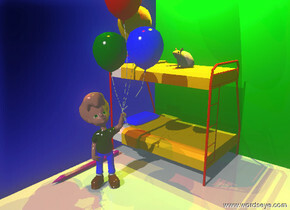 the yellow light is three feet above the rat. the red light is three feet above the child. the orange point light is ten feet above the pencil. the chartreuse light is three feet above the bed.